- Touch and continuous operations. - Aluminium cast base avoids unnecessary moving. - Optional vacuum suction feet hold to the work surface and prevent the unit from moving. 2. LCD display indicates the speed and time for MX-RL-Pro. 3. Material of the tube holder: Stainless steel with oxidation coating (MX-RL-E), Stainless Steel (MX-RL-Pro). 4. Material of the clip: Plastic (MX-RL-E), Stainless Steel (MX-RL-Pro). 5. Three clip sizes are selectable, suit for the tubes: 1.5ml, 15ml, 50ml. Designed for mixing liquids in Schools, Laboratories & Factories Touch/ Continuous Operation mode Selection through bi-directional Switch Speed Regulation through knob provided on the control panel Interchangeable mixing heads for use with variety of tubes. Leveraging on the support of sound infrastructure and adroit workmen, we are capable of presenting Laboratory Pan Mixer to clients. 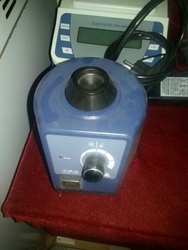 Offered Laboratory Pan Mixer is used to mix any type of material in laboratories. We also check these products for quality to ensure their long term use. - LCD display indicates the speed and time for MX-RL-Pro. - Material of the tube holder: Stainless steel with oxidation coating (MX-RL-E), Stainless Steel (MX-RL-Pro). - Material of the clip: Plastic (MX-RL-E), Stainless Steel (MX-RL-Pro). Thermo Mixer is another quality product offered by the company. It is excellent with its operational speed. These world class Thermo Mixers are equipped with MS powder coated Cabinet Box with 24 tubes holding capacity. 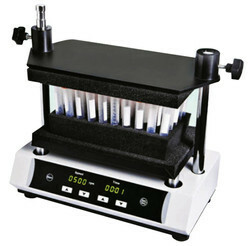 They are specifically made to cater the needs of the customers like scientists and doctors. Enzymatic and RIA assays, General test tube mixing, Biochemical assays, Vortexing cell suspensions, Mixing tissue samples, Viral dilutions preparations, Precipitated Assays.